Cannonball Run turned 30 years old this week. So for Double Feature Friday, here are ads for the sequels. 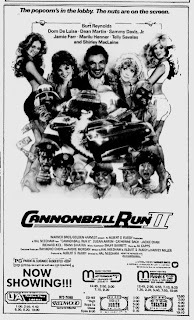 Here's the first sequel to Cannonball Run from 1984. Nearly all the main characters returned plus tons of other new celebrity cameos were added. 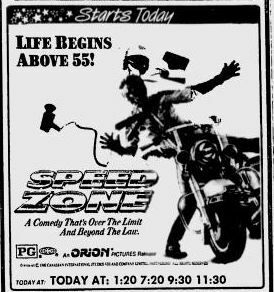 Here's the unofficial second sequel to Cannonball Run, Speed Zone from 1989. 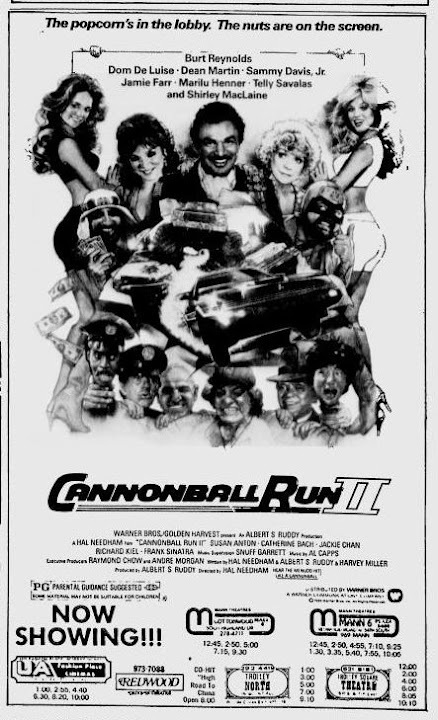 The original title was Cannonball Run III, but it was changed at the last minute. The only character to return in this movie from the first two is The Sheik played by Jamie Farr. 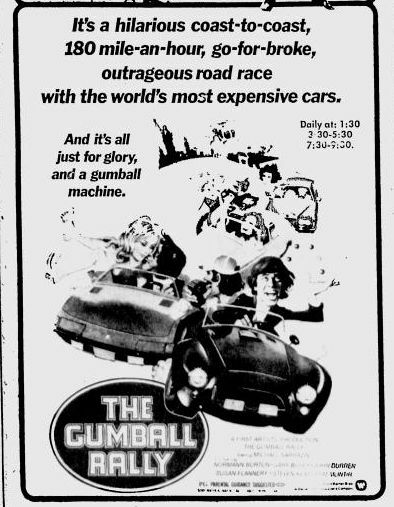 Here's an ad for The Gumball Rally. The Cannonball Run turned 30 years old this week. So I'm looking at ads for other "cross country race" movies this week. 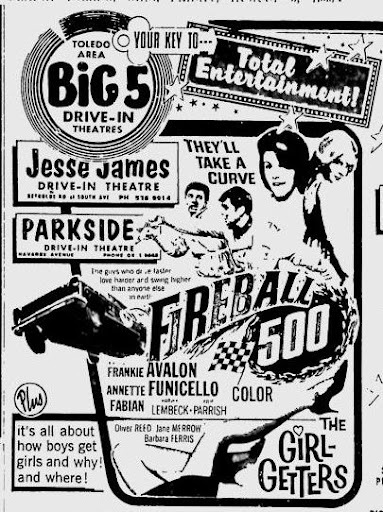 Here's an ad for the Frankie and Annette feature, Fireball 500. The movie also starred teen idol Fabian. Moonshiners finagle stock car driver Dave Owens (Frankie) into a cross country road race. Dave is helped by Jane (Annette) and Leander (Fabian). Dave and Leander begin a friendly rivalry for Jane. The Fireball 500 of the title was a heavily customized 1966 Plymouth Barracuda. 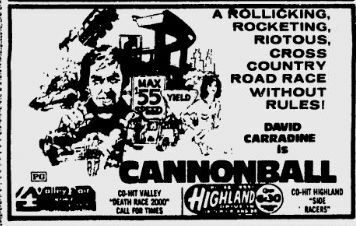 Cannonball Run turned 30 years old this week, so I'm looking at ads for movies about cross country car races. 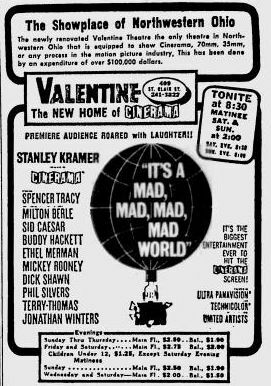 Here's an ad for It's a Mad, Mad, Mad, Mad World from 1963. This was an all-star comedy featuring Spencer Tracy, Mickey Rooney, Phil Silvers, Buddy Hackett, Sid Caesar, Milton Berle, Ethel Merman and Johnathan Winters. Cannonball Run turns 30 years old today. So here's an ad for the first one. 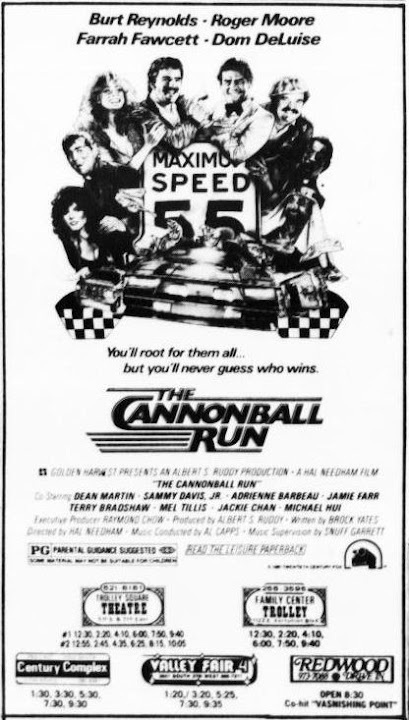 All week this week I'll look at ads for movies that were similar to, if not direct inspirations for, Cannonball Run. 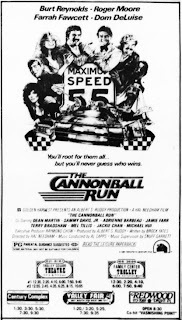 I talk about the real life origins of the Cannonball Run movies here. 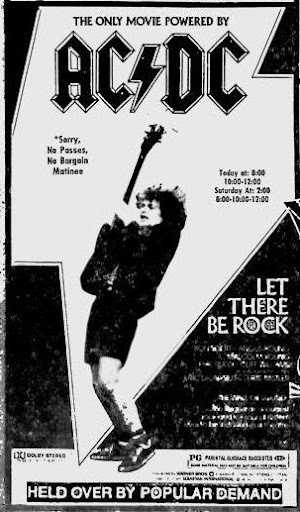 Here's a 1982 ad for a re-release of the AC/DC concert film, Let There Be Rock. The movie was originally released in 1980 and featured footage from their concert in Paris in 1979. That 1979 tour would be the last for original lead singer Bon Scott who would die while recording the album Back in Black in late 1979. This movie was released on DVD today.